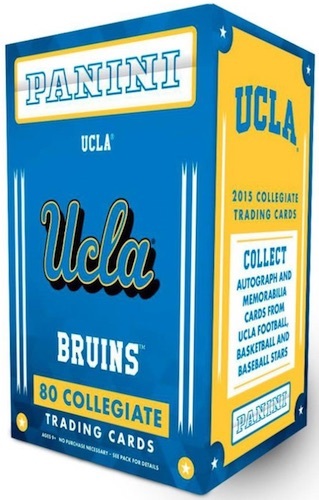 2015 Panini UCLA Bruins Collegiate aims to cover the sporting history at the University of California, Los Angeles. Although the storied basketball program is a main feature, the multi-sport release also looks at former greats from football and baseball. Each box averages one autograph or memorabilia card. Highlighting top names and events from the past, the base set is comprised of 80 cards. The biggest basketball names include Bill Walton, Kevin Love, Russell Westbrook and Jrue Holiday. The set also includes 2015 NBA rookies Norman Powell and Kevon Looney. Football is featured with a pair of quarterbacks in Troy Aikman and Brett Hundley, while the UCLA baseball diamond is represented by Gerrit Cole, Chase Utley and Trevor Bauer. Extending to some of the football, basketball and baseball subjects, the main hits include Signatures and Memorabilia cards. By way of the In Honors insert, former award winners for the Davey O'Brien (Top College QB) and Golden Spikes (Best Amateur Baseball Player) are further celebrated. Silver, Gold and Black parallels expand on the base and insert sets with more limited versions. Although collectors can find both blasters and traditional hobby boxes, the main output is similar with one hit and three parallels. In addition to UCLA, Panini has released many other sets specific to top schools. The 2015 Panini Collegiate Trading Card line features, Alabama, Ohio State and many others.